Joe Kelly has a pretty good sinking fastball, and it’s helped him hold down a 2.70 ERA through his first 6 big league starts. Little do people realize that Kelly perfected his sinker at altitude. No, we’re not talking about pitching in Colorado with baseballs from a humidor. Think just a bit higher. That’s right. Joe Kelly can actually make his fastball sink on the moon in approximately 1/6 of Earth’s gravity. Beastly, yo. 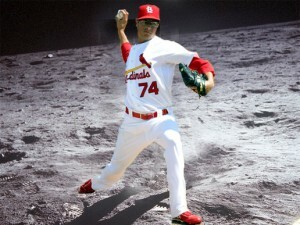 Also, I should point out that the image above is technically a “moon shot”. Just thought you should know. 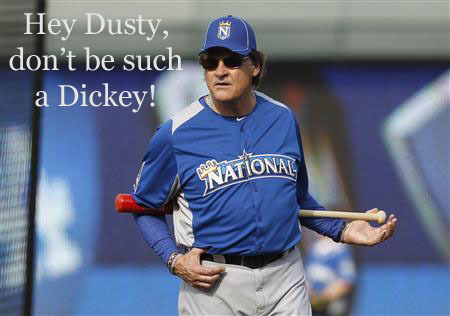 As manager Tony La Russa prepared to coach the NL team in the 2012 All-Star game in Kansas City, he had 1 final thought for Dusty Baker. Since Dusty wasn’t actually in KC at the time, we’re not sure who TLR was actually talking to, but we’re sure Dusty got the message. TLR also expressed disappointment in Baker for showing a legitimately poor understanding of the All-Star selection process. To his credit, TLR tried to make amends during the 4th inning when he called down to the bullpen for Johnny Cueto to warm up, but it turns out that Cueto wasn’t even there. Oh snap! You will have to click the image to enlarge it, but it’s so worth it to see what happened when Allen Craig was the only player in the “Closest to the Pin” contest at Busch Stadium a few weeks ago. As you can see, the flag was located in dead center just above the 400′ mark. Craig reached the grass there 2 times in the same game. Unfortunately, there were no other contestants. Heath Bell produced one of the season’s most epic fails in blowing a save opportunity against the Cardinals. On the positive side, he did manage to provide his fitness program of choice with some free airtime. No, it’s not crossfit or P90X. 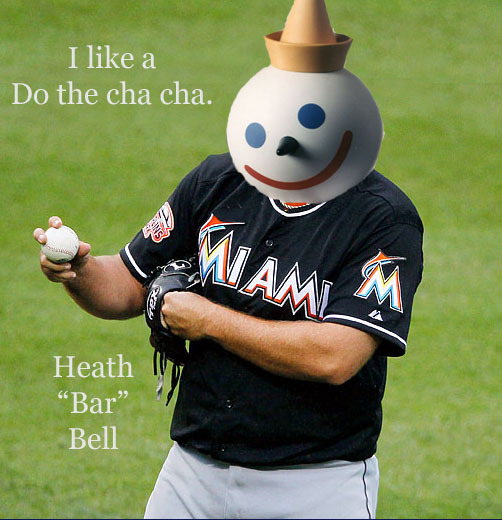 Heath Bell owes his current state of fitness to the wonderfully delicious food served at Jack-in-the-Box after midnight. Also, Bell admitted in the post-game interview that “I like a do the cha-cha.” whatever that means. Here at PH8, we are constantly asked about former MLB’ers as if we know anything about anything. However, we do have a wide network of pathological fools who follow our respective Twitter feeds, and when someone asked about the whereabouts of Jeff Kent, we passed along the word. 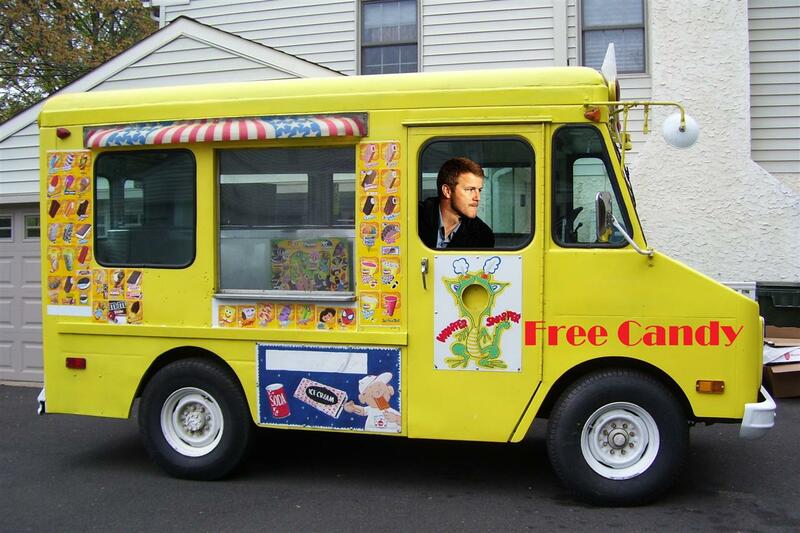 As it turns out, 1 follower located Kent somewhere in Middle Earth driving an ice cream truck that apparently makes “free candy” available. We’re not sure about this business model, but it does seem like Kent is as happy as ever. Creepy as anything but happy. We do not usually cover much St. Louis Rams news, but we have a certain obligation to pass along newsworthy items. Actually, we don’t, but that’s the excuse I use whenever a great pic or gif shows up on the interwebz. Rams head coach Jeff Fisher put up this image as his profile pic on Twitter. That sad thing about this image is that he probably isn’t even joking. 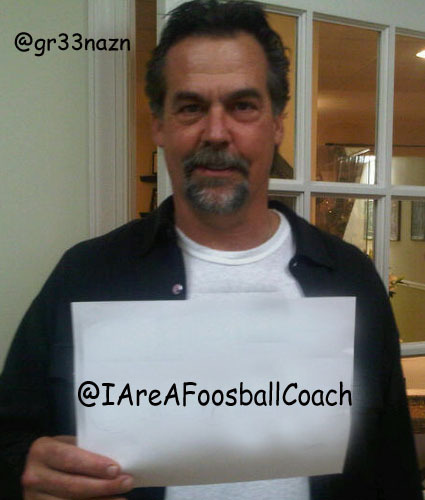 He is most definitely a foosball coach. 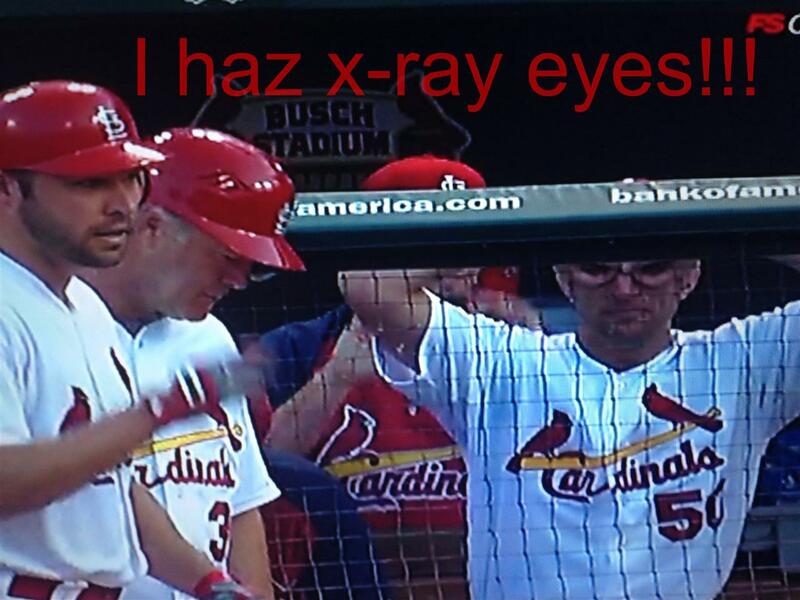 After going through hours and hours of game film, we have finally identified the sign the Cardinals use for either the “hit and run” or when Adam Wainwright wants to play “peek-a-boo” with Jake Westbrook. 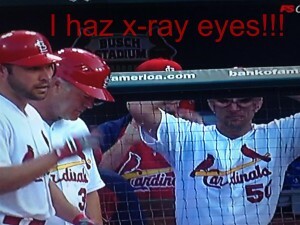 Yes, that’s Wainwright the professional athlete who gets paid for doing this. Follow gr33nazn on Twitter for more news that really isn’t! P.S. It may or may not be worth pointing out that the Roman numeral system used for the “Not The News” series involves just a bunch of guessing as to how the “X”, “I”, “V”, “C”, and “M” letters go together.